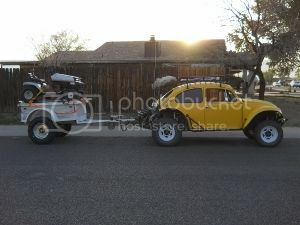 AzBaja.com, Home of the VW Baja Bug -:- Baja Forums -:- Off-Road & VW Based Clubs (4x4, ATV, Jeep, Motorcycle) -:- Events and Get Togethers World Wide -:- The AVC Hassayampa River run! Feb 2th @ 9am. Baja Forums -:- Off-Road & VW Based Clubs (4x4, ATV, Jeep, Motorcycle) -:- Events and Get Togethers World Wide -:- The AVC Hassayampa River run! Feb 2th @ 9am. The AVC Hassayampa River run! Feb 2th @ 9am. Post subject: The AVC Hassayampa River run! Feb 2th @ 9am. The Hassayampa river Run February 2 at leaving at 9 AM. The Hassayampa River run starts at the waffle House at 83rd Ave. and McDowell we leave from there drive up to 339th Ave. Turn right to McDowell Road then we then take McDowell Road to the bottom of the Hassayampa River most non-Street legal vehicles meet us at this point. Then we drive up the Hassayampa River to Wickenburg the non-Street legal vehicles will turn around and go back down the Hassayampa River run while the rest of the vehicles going to Wickenburg for lunch then we take the constellation mine Road over to the Castle Hot Springs Rd. then exiting at the lake pleasant recreation area. This is a very easy run a stock Baja can easily make this event. February 16th to 18th Florance campout. My little 1385cc class 11 car made it last year! Word of advice, air down and bring an outer cover for your air filter! Lessons learned. Dalton and his crew were great and made sure I made it out alive! I might want to do this, just depends on what's going on at the time. I also will have to drive it some more to make sure I'll get there and back. Going to try for this one. Depends on dune trip schedule. Always wanted to run the river. Hope to see you there. Post subject: Re: The AVC Hassayampa River run! Feb 2th @ 9am. thought I plan on taking my Baja with a 1600 single port it this year. The AVC #1 rule is everyone comes home. This is a very easy run. Check every nut n bolt before hand and make sure your air filter is sealed. That is a work weekend and my Birthday weekend and the super bowl weekend etc. etc. What will I ever do???? Supposed to find out this week re: dune schedule, but would really like to run the river. I Plan on towing my Baja to the Start point and driving back to my Xterra after eating lunch with everyone at Wickenburg. I'll probably see if I can get to a couple of places that we saw on google maps along the way and do some more exploring, time permitting. Excellent!!! Some more Baja's to play with on the way up.. I was planning on driving my Baja out in continuing on the entire run exiting out by Lake pleasant with Kenny leading the pack and myself at the back of the pack this year's HossYampa run is going to be awesome. It sounds like a few of you are going to be towing out driving up to HossYampa, eating in Wickenburg and then returning coming back down the HossYampa this is another way to enjoy this run. I look forward to seeing you all out there. I pre-ran the HossYampa a few weeks ago to try to work out a few bugs in my car I found that after the first mile the river bottom was a pleasure to drive on with my 1600L motor my top speed was recorded at 51 miles an hour but most the time I was somewhere between 35 miles an hour and 45 miles an hour I am hoping for another day in the 70° weather. We are in. Dune trip will be later in feb. Looking forward to the fun. leaves from the hassayampa at 9 am? or leaves from the waffle house at 9 am? I took it as leaving the Wafflehouse at 9. I assume it'll take them almost an hour from there to the Hassayampa where I was planning on towing the Baja to. However, I may opt for just driving it. The return trip home is shorter coming back grand instead of coming back down the hassayampa, but I was looking forward to running back so I could maybe hit a couple of interesting things if I can find them. Either way I plan on being there Sat. Dalton, check your pm's. I was planing on towing to river then take streets back to trailer in lieu of running river back. Sounds as if others will take streets back to Waffle House and pure dirt guys will take river back. If you need a running mate back down to river start point, via dirt or street, I am game. Now we just need to firm up river start point time?